Today we’d like to introduce you to Roe Sie. Roe, please share your story with us. How did you get to where you are today? After leaving my corporate HR job and moving to Los Angeles, I decided to take some time to help raise our two boys while my wife, Trish, launched her career as a film director. The plan was for me to go back to a regular job once the kids were older and she became more established. In the meantime, I decided to get better at cooking and gardening. Next thing you know, I’m building aquaponic systems for growing tilapia and veggies in a closed loop ecosystem, milling flour from whole wheatberries for natural sourdough, making my own soap. 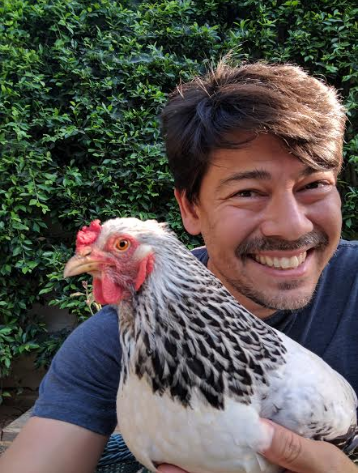 Trish loves animals, so we took the opportunity to get a coop and start raising chickens for eggs in the backyard. Discovering this world of DIY was ridiculously fun and rewarding, but when it came time to interview for my re-entry into corporate life, my heart just wasn’t in it. Making and growing stuff from scratch, knowing where your ingredients come from, and being able to do it in the small space of an LA home was a revelation. So, I opened the first King’s Roost location in Los Feliz to introduce “urban homesteading” to the community. I started out by selling kits, but the business has now grown into a larger space with a teaching kitchen, a bookstore and our own line of soaps and candles. It is wonderful to see the community’s interest growing in sustainable and practical self-sufficiency. I’ve been asked to speak around town, and I’m always surprised when I bump into someone who’s heard of The King’s Roost. Once, shooting a movie in Atlanta, a crew member gave Trish a soap sample from her newly-launched soap making business. When Trish told her that she usually gets her soap from a store called The King’s Roost back in LA, the crew member said that she’d learned to make her first bar of soap from one of the King’s Roost videos Trish and I had made together. Starting a business is never smooth. Just as we were hitting our stride, the landlord quietly sold the building where our shop was located, leaving us with only 3 weeks to vacate the space. We had to find a new location, sign a lease, build a kitchen, and move the entire store in record time… and all just a few weeks before the holiday retail season kicked off. Luckily, there was a space adjacent to Sunset Junction on Sunset Blvd. Not only convenient, the new space is twice as big, and even less expensive than our first location. The fast-paced move was incredibly stressful, but having a kitchen/workshop space to teach my classes and make our own products was the best thing that has happened! The King’s Roost – what should we know? What do you guys do best? What sets you apart from the competition? While we carry kits and supplies for making everything from soap and candles to sauerkraut, beer, and cheese, it seems like home milling and sourdough bread baking is what is resonating with the community right now. People seem to be fed up with the un-digestible “gluten bombs” that pass for bread in our stores and want a healthier more delicious alternative. Far and away the most popular class I teach is my homemade bread baking class. The class gets waitlisted almost every time I teach it. The bread class draws students from all over Southern California because we select and mill the grains in class and bake bread using only 100% freshly milled wheat berries, a natural starter, & salt water. That’s it. No refined flour, no instant yeast (yuck), no sifting, no sugar or oil or eggs. It is actually quite rare for whole wheat bread to be made with only whole wheat, since the FDA allows bread to be called whole wheat when it has as much as 49% refined flour in it. So, what I teach is true bread the way it was made it for thousands of years. Very few bakers are doing it this way anymore, but interest is growing. I also love showing folks that come into the store how easy it is to roll your own oats. I demonstrate with oat rollers and grain mills that you can come in and play with. Rolling your own oats and milling your own flour is a game changer, kind of like grinding your own coffee beans, and yet it’s surprising that The King’s Roost is the only store I know of in the country that has home grain mills on display and for sale. My wife, Trish, has been a critical business partner from day one and is still a key advisor in keeping me focused on what’s important. In between her projects, she would take her valuable free time to help set up the store: marketing, shopping the wholesale markets, creating logos and signage, managing social media. For the first six months the business was open, we decided to start a DIY YouTube channel. We’d spend one full day each week that the store was closed recording a video that she would then spend the next few nights editing and uploading. It was intense for both of us, but it’s paid off as we now have over a million views and thousands of subscribers. I know the concept wouldn’t even exist if it weren’t for her help getting the momentum going in those early days. I am so proud of you Roel and Trish as well.